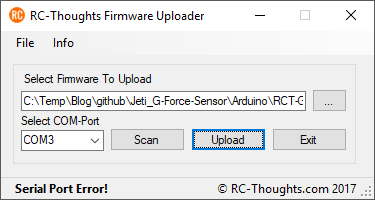 Programming Arduino’s with DIY-sensors firmware can be a hazzle. There is a few options out there like installing Arduino IDE, working with libraries and so on. 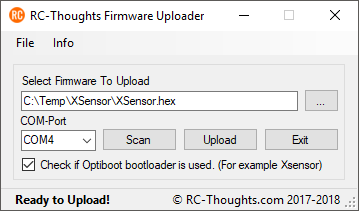 Then there’s small and simple XLoader used to upload .hex file to Arduino board. 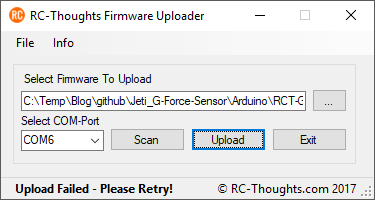 XLoader has some (at least to me) annoying features, it does not behave well when upload is failed. Also if uploading several boards it can be a bit difficult to see if everything is ok or not. So, I made own uploader with an philosophy “less is more” aimed to basic user with no installation needed and simple but informative progress on upload. Windows XP is not officially supported at this moment. Main difference to XLoader is that often XLoader does not update the status-strip. 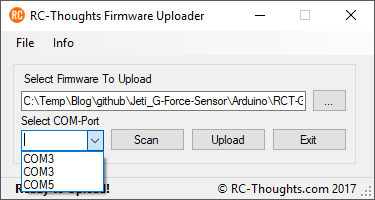 Also XLoader does not monitor the avrdude-process so user needs to open taskmanager and kill it in case of upload-error or stuck avrdude. 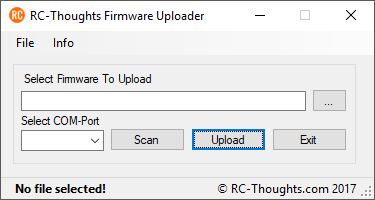 RC-Thoughts Firmware Uploader tries to make sure avrdude-process is not left to hang. Also there is no need to close/reload the app in case of missed upload. 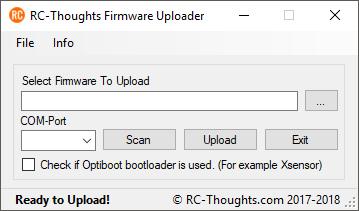 Uploader application is started by double-clicking the executable RCT-FW_Uploader.exe file. Using the application is very simple. Application has a minimal amount of settings. I usually do not solder any pins to Arduino, instead I have 4 pins in the cable and simply put them into Arduino programming holes. Makes a neater end result. 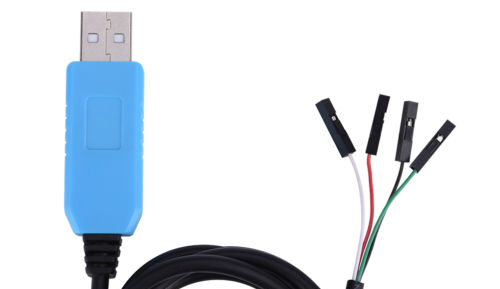 Now you have selected correct hex-file, serial-port and you have connected Arduino. Procedure is simple, press Uploaders “Upload”-button and right after that press Arduino’s reset-button. 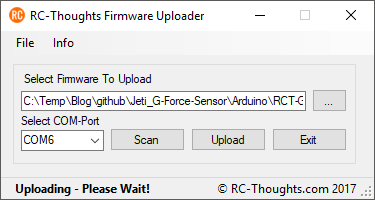 Timing of Arduino’s reset-button might take few tries but you’ll get it. I have found that following method works quite well: Press the “Upload”-button then quickly press the Arduino’s reset-button with same finger. The time it takes for you to move your hand is pretty much correct every time. Your DIY-sensor is now ready! In this case check your serial port COM-port so it’s correct. As error-message tells you, please retry. 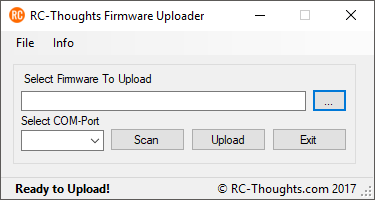 RC-Thoughts Firmware Uploader comes “as is” with no warranty whatsoever. Always make sure everything works as it should. Do not use faulty devices. neither RC-Thoughts and/or me are in any way liable or responsible for anything you do with your equipment or to others with equipment used as described here. You should never use LUA-apps for operation-critical functions.